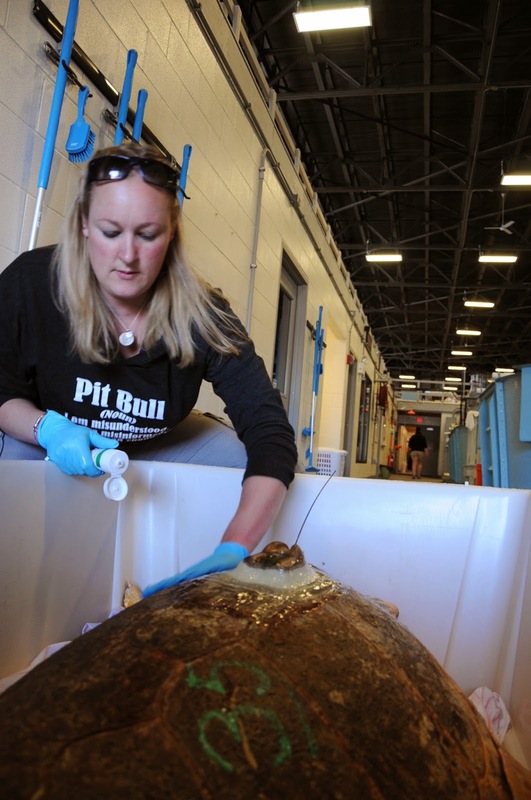 On June 22, 2014 the four loggerhead sea turtles we met in the Return of the Loggerheads blog were transported from Aquarium's Rescue and Rehabilitation Center to Assateague State Park in Maryland for release. The Rescue Team was lucky enough to be joined by Asheley Simpson and Shannon Prendiville. Shannon and Asheley played a crucial role in the rehabilitation of these four loggerheads. The Rescue Team is forever grateful to these two for their tireless dedication and expertise. Release day started in the early morning hours on Sunday. All the turtles were prepped and loaded into the vehicles for a ride down to Maryland. Two loggerhead sea turtles, Sugar Plum and Andes were outfitted with satellite tags. The satellite tags give us the opportunity to track the turtles' migrations. For an exciting opportunity to watch the turtle's movements you can go to seaturtle.org. Asheley applies lubricant to Andes to help keep the turtle moist throughout the journey. It takes a team effort to load these large sea turtles into the vehicles. Upon arrival to Assateague State Park, the Aquarium Rescue Team was greeted by a number of excited onlookers and Assateague State Park personnel. The crew, with turtles in tow, hitch a ride with Assateague State Park personnel down to the beach. Andes taking a peek before the release. Candy Cane waiting patiently to be released. Candy Cane relieved to be out and making headway towards the water. Patience pays off, Candy Cane hits the waters edge and makes the journey out to the ocean. Shannon and Asheley help release the smallest and feistiest of the loggerheads, Maple. The team works together to release a 140 pound loggerhead named Sugar Plum. Sugar Plum makes it out to the ocean. Sugar Plum is outfitted with a satellite tag; you can follow this turtle's movements on seaturtle.org. Shannon and Asheley share a hug and smile after watching the turtles they worked with make their way out to the ocean. The Aquarium Rescue crew, celebrating a job well done after a long day of driving and releasing the four large loggerhead sea turtles.